resisting arrest Archives | South Carolina Personal Injury Attorneys | Criminal Defense Lawyers - Strom Law Firm, L.L.C. South Carolina Personal Injury Attorneys | Criminal Defense Lawyers - Strom Law Firm, L.L.C. The Personal Injury Attorneys and Criminal Defense Lawyers at Strom Law Firm handle cases throughout South Carolina. Call us today for a free consultation 803-252-4800. Joseph Preston “Pete” Strom, Jr. Send Me The Next One! © 2019 Strom Law Firm, L.L.C. All Rights Reserved. Disclaimer. 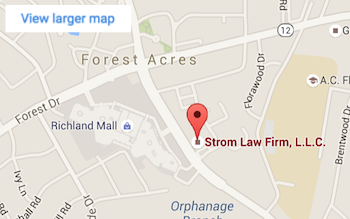 Centrally located in Columbia, South Carolina, the attorneys at the Strom Law Firm, L.L.C. represent clients in a variety of civil and criminal matters. We handle cases throughout South Carolina including Columbia, Lexington, Florence, Camden, Aiken, Charleston, Orangeburg, Irmo, Gilbert, Red Bank, Blythewood, Gaston, West Columbia, Chapin, Rock Hill, Saluda, Lancaster, Sumter, Spartanburg, Newberry, North Augusta, Batesburg-Leesville, as well as cases in Richland County, Lexington County, Fairfield County, Kershaw County, York County, Newberry County, Calhoun County, and Sumter County. The information you obtain at this site is not, nor is it intended to be, legal advice. You should consult an attorney for advice regarding your individual situation. We invite you to contact us and welcome your calls, letters and electronic mail. Contacting us does not create an attorney-client relationship. Please do not send any confidential information to us until such time as an attorney-client relationship has been established. Strom Law Firm, L.L.C. on Google+ and Pete Strom on Google+.